I encourage others to find exciting and new ways to experience Alaska. I encourage others to find exciting and new ways to experience Alaska. Think outside the box. Amazing trip! All the way from Skagway to Carcross by train then back by bus! Highly recommend. When we booked we were told we will cover emerald lake as well. When we booked we were told we will cover emerald lake as well. We were a bit disappointed that it was infact not part of the excursion and we were given wrong info earlier. We booked the longest ride available and it was absolutely worth it (as some only go half way). We booked the longest ride available and it was absolutely worth it (as some only go half way). Lake Bennett was incredible! Be sure to get a seat on the left side of the train as that&apos;s where the best views are! We did the 9:30 AM Bennett Lake excursion with Chilkoot Charters. Best excursion of the trip. Best tour we have ever taken anywhere. Best tour we have ever taken anywhere. We saw so much more then just what you woud see on the train and our guide, James was so knowledgable and also a great storeyteller. Carross, Emerld Lake and all other sights were amazing. Jamison (our guide) offered a wonderful tour. Jamison (our guide) offered a wonderful tour. He was very knowledgeable and funny as well. 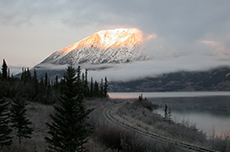 The railroad is really one of the best excursions in Alaska for all kinds of travelers. We did the bus and train adventure. We did the bus and train adventure. It was a great tour. My husband and 13 year old son said this was the highlight of the trip. Highly recommended. Great way to spend the day in Skagway. Bus tour up to Emerald Lake with lunch included. Bus tour up to Emerald Lake with lunch included. A great view of the Yukon. Stops in Corcross. Enter and exit Canada. Will do a declaration afterward. Overall interesting, though scenery somewhat repetitive. Overall interesting, though scenery somewhat repetitive. Long lines, much waiting to board. Staff confused regarding trains to board, order of boarding. Great tour guide on the bus. The train ride was excellent - very scenic. It&apos;s a beautiful view out in the mountains! Even the bus driver knew that our ship had low crew moral. Even the bus driver knew that our ship had low crew moral. Enough said. He was excellent and well prepared. I booked the Bennett Scenic Journey using Chilkoot Charters which lasts about 8 hours. This really was all one excursion, White Pass Yukon route to Cargross.